What is it really like to go on a spacewalk? Some astronauts have said there are no words to describe the experience, but we talked with astronaut Chris Hadfield – the same guy who gave the best description ever of going to the bathroom in space – and asked him to convey his thoughts about his EVA experiences. Hadfield has done it again, and has now given the best description ever of a spacewalk. UT: Chris, you were part of the STS-100 space shuttle crew that flew to the ISS 2001, and you had the opportunity to do a couple of spacewalks to help in the construction of the station. I once heard you describe one of your spacewalks where you said you were holding on to the side of the space station with one hand with your face into the wind as it were, and you were looking out at the rest of the entire Universe. For all of us that wish we could experience it, what is it really like to do a spacewalk? Chris Hadfield: Gosh, I’m not sure how to describe it. I was there for the birth of all three of my children. I did the first F-18 intercept of a Bear bomber off the coast of Canada. I represented Canada in a bunch of different levels, including as a fighter pilot. I was a test pilot doing all sorts of very fascinating, challenging, brand new work. I went to Mir, I went to the ISS. But nothing compares to going outside for a spacewalk. Nothing compares to being alone in the Universe; to that moment of opening the hatch and pulling yourself outside into the Universe. Sometimes you’re driving on a mountain road, it’s slippery and you’re doing a bunch of curves and you don’t really see anything because you have a cliff falling away on one side and another cliff up on the other. But suddenly you come around a corner and you say, “Oh wow!” And there you’ve got the whole valley in front of you, or they make one of those nice pullovers where you can stop and look out, and you do, and you stop and you get out of your car and walk over to the edge and you see where you are, where all those little myopic turns have taken you. A spacewalk is very much like that in that the opening of the hatch is probably step 750 of the day. And steps 1 through 749 were all boring and minuscule and each one was on a checklist and you had to do every one right, so you were very painstaking. But suddenly you do this one step, and suddenly you are in a place that you hadn’t conceived how beautiful this could be. How stupefying this could be. And by stupefying I mean, it stops your thought. You’ve probably heard me say this before, but I knew I couldn’t keep notes up there and I would forget stuff so I sorta resolved to myself that I would verbalize and attempt to, as eloquently as I could, express what I was feeling and what I was seeing so that later I could listen to the recordings of it and remember, and not have missed such an amazing experience. And yet when I listen to the transcripts of what I said, most of it was just, “Wow!” It was so pathetic! But the experience was just overwhelming! So, it’s an extremely distracting place to work. But it also really puts yourself into perspective because this human creation is right next to you and its inherently, massively beautiful, like the prow of the Titanic or something, where you feel this great human achievement of building this great structure that takes us to a place we’ve never been. But then you notice that even though it is huge and capable, it’s just a speck between everything which is on your left and all the colors and textures of our planet that are just pouring next to you on the right. And you are this little peephole of a microcosm in between those two things, both physically and historically. And you’re very much aware of that the whole time. I’m sort of gushing, but that’s what a spacewalk feels like. It is infinitely worth all the thousands of steps it takes to get there. It’s a great, great thing – I recommend it very highly. 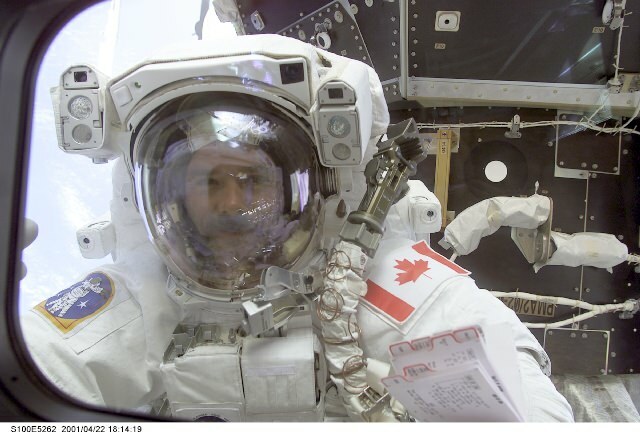 You can hear Chris Hadfield give his description of a spacewalk, as well as talk about NASA’s current situation and his views on the International Space Station on the March 11, 2010 edition of the 365 Days of Astronomy podcast.